Butterflies here, butterflies there, almost everywhere non-state residents on a typical beach vacation look, they experience the distinct pleasure of seeing and photographing many Florida butterflies they do not ordinarily see in their home state. 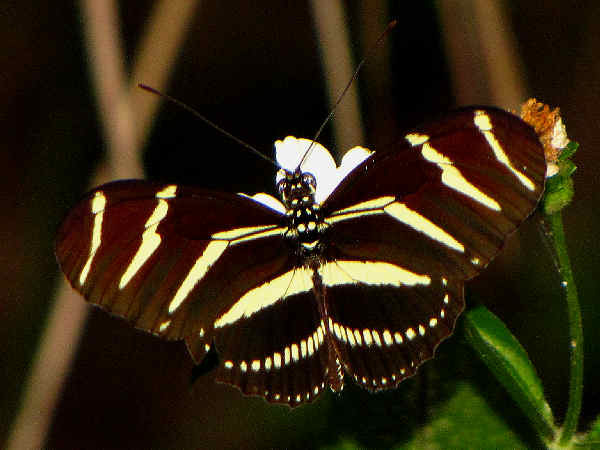 The Zebra Longwing or Zebra Heliconian in the top picture is only one example. It’s also the official state butterfly. 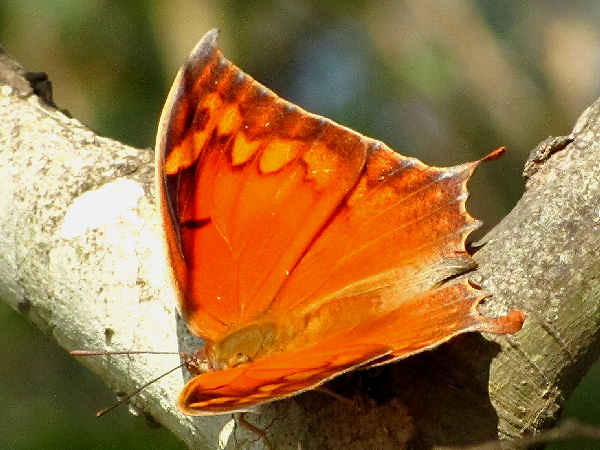 This introduction to Florida butterflies presents a list of the species divided into families. By default, it often deals with butterfly colors such as white buterflies, yellow butterflies and blue butterflies. Space limits the number of butterfly pictures that can be shown. Please press the green butterfly button for additional butterfly pictures and information. Common Brushfoot butterflies such as Gulf Fritillaries, Monarchs, Queens, Crescents and Buckeyes visit most gardens around the state. As a group they are the most common species that Florida tourists will see. The ones marked with R are rare, the ones marked with E are endangered. 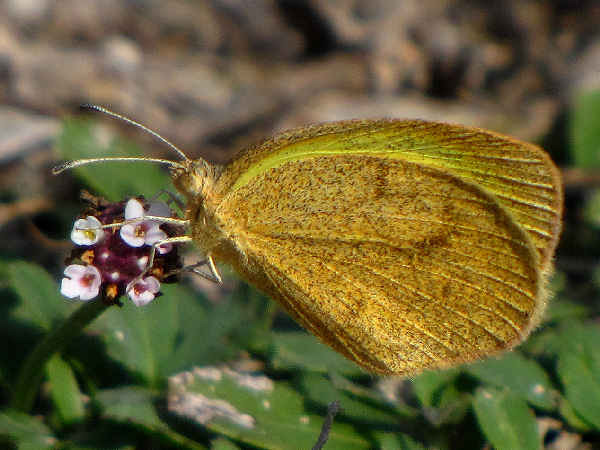 So for example, the picture shows a Goatweed Leafwing butterfly. The list also has the Florida Leafwing marked as endangered. Leafwing butterflies often fold their wings at rest and the underside of their wings are brown. It provides them camouflage. Many of the Brush Foot species have orange wings. Looking as the shape of the wings and the patterns on them are the basic field identification guides. 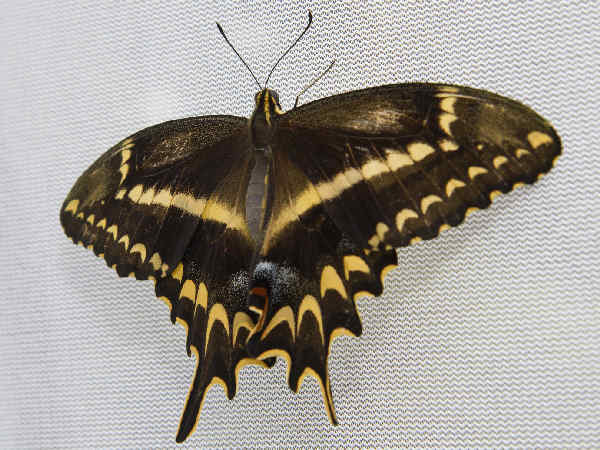 With ten documented species, visitors will never have to look far to see Swallowtails, the physically largest of the butterflies. They constantly fly around gardens and all places with flowers. The top picture shows a Palamedes Swallowtail. Look for it around swampy areas everywhere in Florida with the exception of the Panhandle. Of course, butterfly enthusiasts can never get enough of swallowtails. 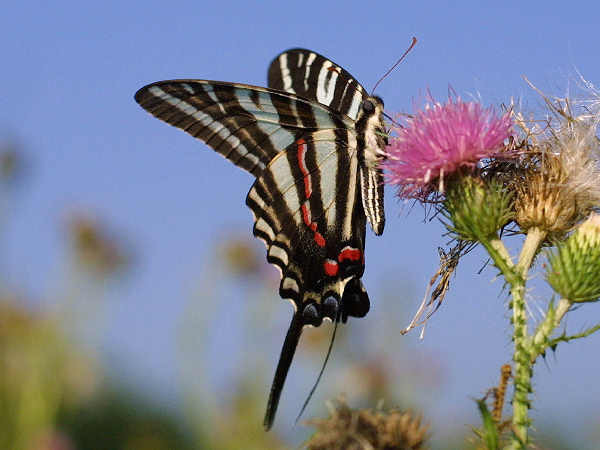 Here’s the always fabulous Zebra Swallowtail butterfly. 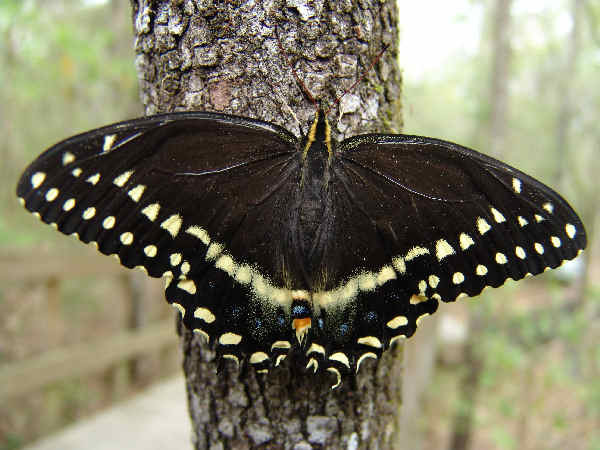 In most areas of the state, tourists will also see a handful of Swallowtails, Yellows, Hairstreaks and Brushfoots. They are the categories with the most species and the most wide ranging species. All states have different mixes of butterfly species, Florida is no exception. There are no Copper Butterflies in the state and only one Metalmark species, the Little Metalmark. 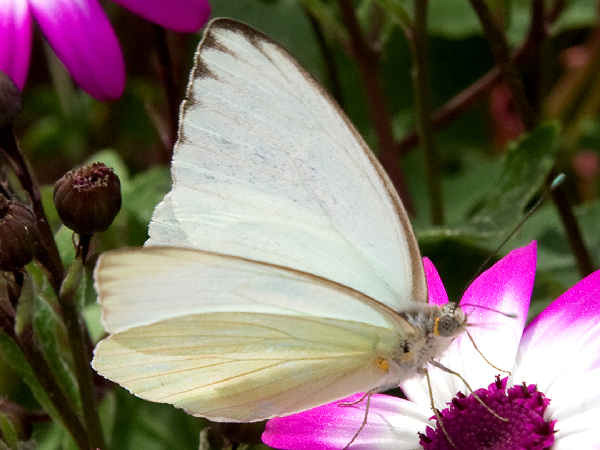 The whites and yellow butterflies technically belong to the same family, Pieridae. The top picture shows a Barred Yellow butterfly. The second picture shows a Cloudless Sulphur. Florida butterflies also include the Great Southern White in this group. The larger than average size and the blue tips at the end of the antenna are great field identification clues. Here’s a list of the rest of the white butterflies and yellow butterflies documented in the state. 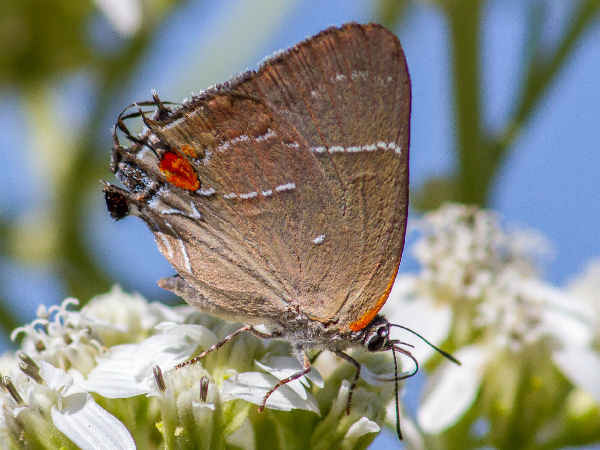 Pro-tip for tourists: keep your eyes peeled on the ground and around shrubs for the small Hairstreak butterflies. With almost two dozen different species documented in the state, multiple species can be found living around almost all tourist destinations. As a note, there are no documented copper butterfly species in the state. The first picture shows a Red-banded Hairstreak. The second picture shows a White M Hairstreak. 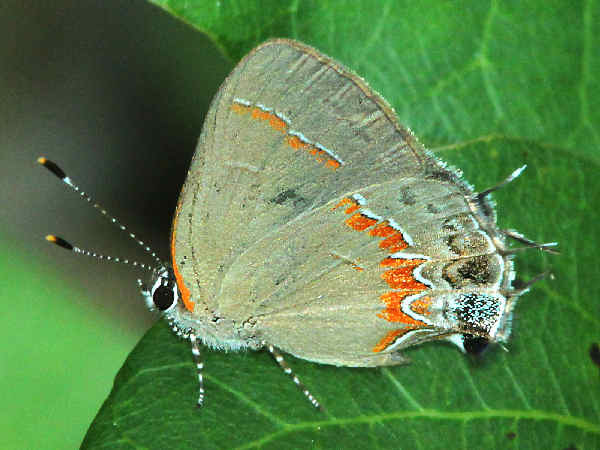 Note that it only takes a few different lines of orange color along the wings to differentiate the two Hairstreak species. 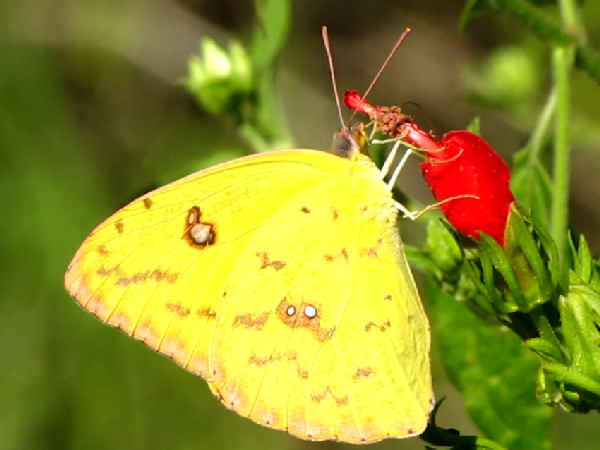 Many of these small butterflies share physical characteristics. Taking many pictures during an outing and then comparing the pictures later increases the chance of getting pictures of multiple species. Butterfly enthusiasts and long term Florida residents see the same species and a little bit more. For example, they have documented the presence of over one-hundred and fifty different Florida butterflies. Close to one-half of them fit into the skipper family, that consists of the predominantly small, brown winged butterflies that often go unnoticed by any but the rabid butterfly enthusiasts. Long term Florida residents have also noticed dwindling butterfly populations as population growth and the economic growth that accompanies it, encroached on butterfly habitat. A few years back three native butterflies were designated as extinct, the Florida Zestos Skipper, the Rockland Meske’s Skipper, and the Keys Zarucco Skipper. Two more species, the Bahamian Swallowtails and the Nickerbean Blues no longer live in Florida, however there are some Caribbean populations. A handful of Florida butterflies have also been listed as endangered, with the Miami Blue and the current public relations campaign to save it, serving as the poster child for the downward population trend. The picture shows the Shaus’ Swallowtail, another endangered species. Encouraging local residents and public officials to create butterfly gardens represents one element of the public relations campaign to keep Florida butterfly friendly.